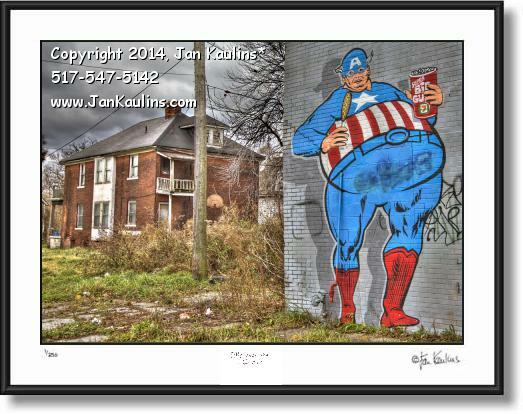 DETROIT GRAFFITI ART photo print picture poster for sale. This DETROIT GRAFFITI ART photo picture art print for sale is an excellent example of the wonderful street art being created all over Detroit, making Detroit one of the most unique cities in the country that celebrate the uniqueness street art and street artists. The artists that create this DETROIT GRAFFITI ART are exceptional artists in a very unique medium format. These DETROIT GRAFFITI ART photo picture prints for sale are made from several bracketed photographic exposures which are blended together and tone mapped, giving the finished photographs offered here a vivid and striking presence.